Hi, everyone! Today I have a card that I am entering into the GinaK Designs challenge this month. Gina challenged us to create a card or project based on our favorite summer memory. I have so many awesome summer memories from childhood and adulthood, but I must admit some of my recent faves have involved a little "firecracker" named Judah! My little guy will turn TWO this Fourth of July. While everyone else was enjoying barbecue and getting ready to watch fireworks on July 4, 2008, I was giving birth to a super sweet little baby boy! ;) So for the past couple of years, this patriotic holiday has meant more to me than just barbeque and fireworks! Here are a couple pics of my youngest sweetie. He is acting like a pirate in this first one and being his joyful self in the next! 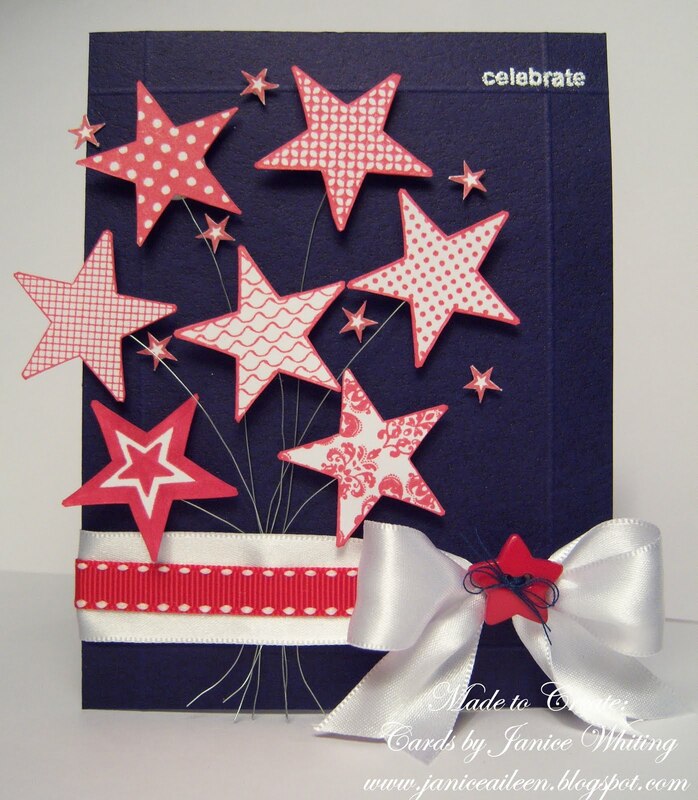 On the card, I used Tami Mayberry's "Stars" and Melanie Muenchinger's "Candles on Your Cake" stamp sets to create my "fireworks." Don't you just love those stars?! I think they are the coolest! The little star image came from Melanie's birthday set (which, along with this cute little star, has many other images that can be used for other occasion cards of projects!). Wow, that is one Teeeeeeriffic card. You are a great designer! I really like this. Your card is so cheerful!! Love it. Wonderful card!! Great job with the challenge. love this Janice, reminds me of the star garland table topper my kids were begging me to buy today at Jo-ann's! What a cute glasses pic!!! Love this Janice! What a fabulous design and a precious little one you have. I have a 2 year old too, born in March '08 :o) Boys are so much fun!!! Wonderful card Janice - great design! Your little guy is adorable! Good luck to you! GREAT card. I love the "sparkler" effect your card gives. I'd be smothered in that little guy's next every day LOL.....what a cutie pie. Love your card. Great detail. It really depicts the 4th of July.